2 – Why does it perpetuate? 3 – How does recovery occur? 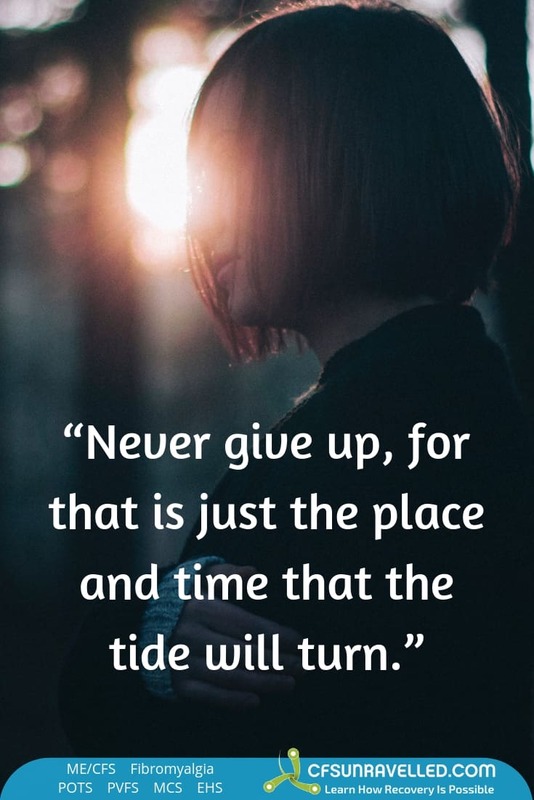 "Never give up, for that is just the place and time that the tide will turn." One of the best books I've read in a long time. Dan should be commended on an exceptional read. Finally someone with a balanced common sense approach to CFS. The hypothesis really fits in with my own personal story and how/why I got sick in the first place. Well done, 5 stars from me! Now time to work on my recovery! This book has given me great clarity regarding the road to recovery. I have just finished reading Dan's book. 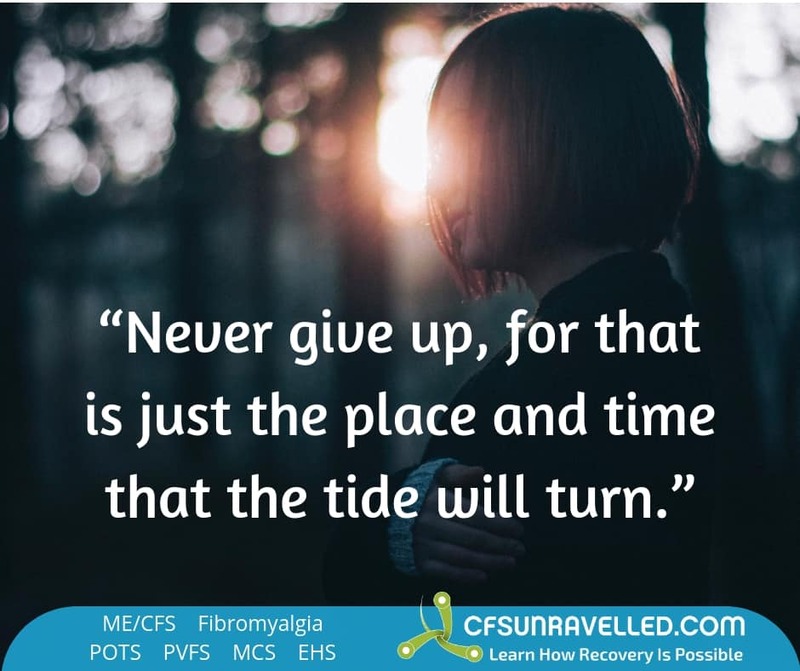 I have had CFS for nearly four years and have spent a lot of money, time, effort trying this and that to get better, including consultations, tests and treatments with professionals specialising in CFS. Dan's book has really helped me to understand what those professionals have been trying to address and to support me with and where I have had misunderstandings about what needs to happen for recovery to take place. With this now very clear understanding of what is happening in my body, I feel like "the penny has dropped", that I am no longer fumbling in the dark looking for answers form a myriad of sources. I know what I have to prioritise to support recovery, and I feel I now have enough understanding about what is actually happening in my body to know what professional advice and guidance to take on board to further support recovery. Someone just switched a light on.... thanks Dan! Intriguing. Well-researched and written. Implementing its information was literally life-changing. Thank you Dan Neuffer for your tenacity, intelligence and talent. Finally, someone who understands what we are going through. I believe that recovery depends on understanding the root causes of this illness and Dan offers the best view yet having been there himself for several years. This book is by far the best investment I have made in this illness, It has given me hope of a full and healthy life where nothing else has. I love this book. I have a clear direction and know what to do to completely heal from CFS. I'm glad I found CFS Uraveled on youtube. After watching interviews with people who healed from CFS I bought the book. I thought I just had to live with CFS. Now I have hope that I can have energy and health again. Dan really does know his stuff, and has recovered from this hideous illness himself. We tend to drive ourselves crazy searching for the root cause of CFS when trying to find the cure, whether it be vaccinations, too much stress, a virus etc, Dan points out the obvious, whatever it was that was your trigger, something triggered the autonomic nervous system to over react for a long time, I like the way he points out that everything else is secondary. I have spent thousands on treating all the different areas of my health that went wrong, nutrition, hormones, methylation, food intolerance, none of it worked because my nervous system was not functioning correctly. A good overall explanation of likely causes of CFS and more importantly, tips for a full recovery. As someone who recovered completely from CFS a decade and a half ago, only to relapse due to my own ignorance of the causes of the illness, I hope this book will help me cure myself for good! I would give 5 stars if the author had gone into more detail on some of the more idiosyncratic symptoms of CFS (of which there are many) and possibly how to deal with them. If you are suffering from CFS or are close to someone who is, I fully recommend you carefully read this book. This information should be the foundation of any CFS related recovery. It is a must read for anyone who wants to heal themselves. I have been reading and researching CFS for two years now and this is hands down required reading. I wish I had found it earlier. CFS is an expansive topic, and further reading will likely be required to delve into topics such as adrenal health or gut inflammation, to name a few, but you must read CFS Unravelled first to fully understand how those treatments fit into the larger picture and understand the source of many people's CFS, the autonomic nervous system. I feel this book is a must read for CFS sufferers, BUT I can also say timing is going to be important in when you read it. I ran across the the CFS unravelled website early on in my diagnosis when I was still looking for that one miracle cure and brushed it off as a sales pitch. I think I followed the typical path of researching this illness to death and coming up with ways to help my symptoms, but nothing to understand the core issue, which is the nervous system. Reading this book, at this time in my illness (after I understood that the secondary problems of gut, fatigue, brain fog, exercise intolerance, etc are just that: SECONDARY issues) has really given me hope of getting my life back. Understand this is not a miracle cure. There is work on your end. But, now I feel like there is light and health again at the end of the tunnel. I thoroughly recommend this book to anyone with CFS and related conditions like Fibromyalgia. This book lets you look at the cause of your CFS and helps in the recovery process. Daniel explains that it is not a quick fix as it took a while to get to this state so with guidance it will take time to recover and he will help you all the way with recovery. Best book on the market for FMS/CFS Suffers. You will find the answers that your doctor can't give you! It is a true LIFE SAVER! Dan breaks everything down to explain how and why we have what we have. It becomes a bit complicated, but hang in there. If you only get the jist of the medical understanding you will be fine. He then goes into how to recover from this/these disorders. It all makes good sense. The recovery phase will be hard work, but once you have completed it, you will have your life back again. You will feel healthy. How can you put a price tag on that? Have an open mind, even if you think you have tried everything and have given up on finding real help. This book IS THE REAL THING!! Finally a book that breaks it all down into language we are able to understand AND offers possible answers to all the WHY DOES THIS HAPPEN. This book could have been written about me... it resonates with me deeply. I wholeheartedly recommend it. Afterall - why not try and help yourself as much as you can, this book offers you this opportunity. This book is a must read! I can not explain how much this book has helped me to understand Fibromyalgia. It makes a whole lot of sense!Doctors barely understand it and are just trying to load you with medications that don't fix the underlying problems. You have to start from the inside out and this book gives lots of great information and resources to help you understand and come up with a plan. This book makes me feel understood......have not finished it yet..but so far, I love it. Looking forward to reading the rest. This is very well researched, and provided information about nutrition and lifestyle that goes far beyond the prevention of autoimmune diseases. These are lifestyle changes that all of us should be considering--not just people suffering from Fibromyalgia! After suffering with fibromyalgia for 13 years, I've read all sorts of theories and 'cures'. This is the first book I have read that provides a thorough and credible explanation for the symptoms of this disorder. Ten days since reading it, I have adopted his dietary recommendations in particular and already feel much better. Highly recommended for both fibro sufferers and their families. 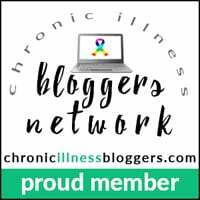 Well written and it covers all the basics of what people with CFS and Fibromyalgia need to know to get some relief. I love this book for its honesty and reader-focus. A very horrible disease that theoretically is incurable ... And see, you too can overcome it. There is much work in this book. I am sure it will be extremely popular among physicians and patients, as well. Dan, I will design your next cover for free! Thank you for doing this valuable contribution to many people. Thank you so much for your wonderful book. 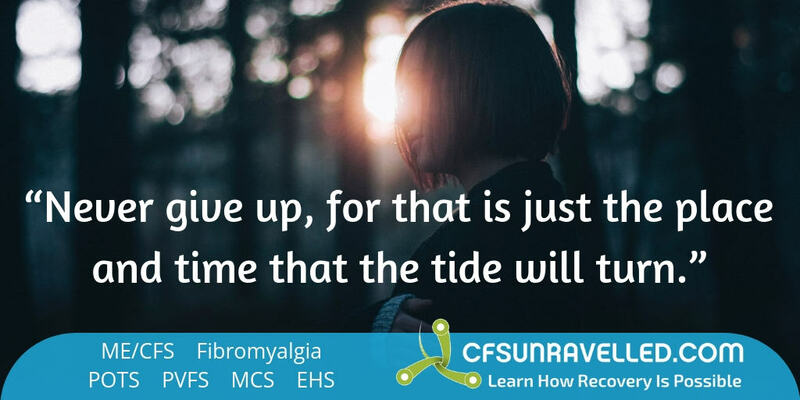 I found it to be an absolutely wonderful take fibromyalgia/CFS survivors and what it takes to really create a regimen that works best for us and our mental health and how it plays a significant role in how we all have the potential to heal parts of our chronic pain. The writer know exactly how it feels to have CFS. I liked that the book was written from someone who had CFS point of view and I am currently trying out his Theory do i can be healthy again like he is. Having fibromyalgia myself, this book was quite enlightening.The information was helpful, describing the disease completely. The book gave me more understanding of how I started with this disease and true possibilities of how I could rid myself of the disease. Thank you, Dan Neuffer. This book was very helpful to me. Written very well and easy to understand. Thanks for this fantastic book. This book is great. I mostly recovered (to a level of 80%) using Amydala retraining. This book helped with with my last 20%. A full recover is possible and i am living proof. I applaud the author for writing it and am so glad i found it. I had waited for this kind of book for a long time. Dan Neuffer explains scientifically how and why it is so difficult to recover from CFS, but also shows that it can be done. After having read this book I slept better and got more hope to recover myself. A clear conscise book based on sound research, with clear , easy to follow guidelines for turning this terrible illness around. The book is extremely informative, well grounded in research and full of hope. It tackles understanding and treating the root causes of such a devastating condition. The author's book was extremely helpful in that he both covers some significant explanations of the cause of CFS yet steps back and looks at the bigger picture, i.e. a dysfunction within the autonomic nervous system. His writing style is clear and he expresses some complex concepts in a thoughtful and thorough manner. I would thoroughly recommend it as a starting point for anyone who is seeking to understand the underlying mechanisms for CFS and a way forward in terms of addressing it! Many thanks for writing this, it is a bit complex but so is ME. It great to read books written by somebody who has actually suffered the same symptoms and gone down the same weary trail. I am trying to follow the advice given - there's nothing hugely complicated so I feel hopeful after 10 years of this horrible illness. I have just read this book as I have had CFS for five and a half years and have tried a lot of different techniques and supplements but have never recovered. This book is written by someone who has recovered and done a lot of research and spent a lot of time on this project. It is well written and goes into fine detail about the causes and how to reverse the illness. I have just started on my action list and can't wait to try the ideas in the book. It gives hope to anyone who has this terrible illness and a lot of things to try. As a sufferer for many years at last I have found someone who writes in easy to understand language. He understands what it is all about and not as many people think 'it's all in your head' The book needs to be read as stated from begining to end. It has left me feeling more positive about myself and I will act on advice given. I found this book interesting as it connected many pieces of information and certainly rang true with my experiences of this illness. I would recommend it. 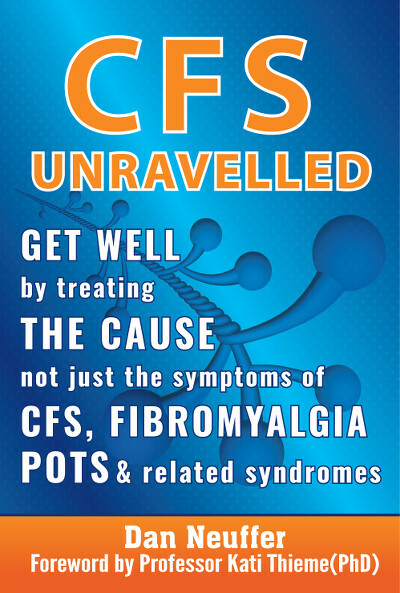 This is the best most comprehensive book on CFS I have ever read and I HAVE READ LOADS!! The explanations about how vitamins affect your body were clear and concise, thank you fr this, have recommended it to loads of my support group members. This is an excellent and comprehensive explanation of the most likely mechanism of CFS and how to help yourself get better. Quite complex explanations but worth trying to follow them. I have been following his advice and have noticed definite improvements. If you suffer from this condition, you'll find it inspiring and helpful. What is Fibromyalgia (FMS) – NOT a pain symptom! Fibromyalgia Symptoms List goes way beyond pain! Chronic Fatigue Syndrome Symptoms List – shockingly long! Lessons from my life-saving surgery that might save your life! Advocacy Video – let’s spread the word together! Disclaimer: The ideas, concepts and opinions expressed in this website and associated products are intended to be used for educational and information purposes only. All content on this website including articles, videos and other products are not intended to replace your physician and is not a substitute for medical diagnosis, advice or treatment and is provided with the understanding that the author and publisher are not rendering medical advice of any kind.